This recipe is one of my all time favs. If you enjoy Vanilla Custards you HAVE to put this juice in your line-up. It could easily be a Shelf Seller even without all the added sweeteners a lot of big brands pile into their juices. Before I started DIY I vaped a lot of Colossus by Cyclops Vapor, which is a bold delicious and very popular Vanilla Custard. When putting this recipe together I kept that Colossus flavor in mind and went for something a little more special with an added creaminess that you don't see coming nor do you know exactly where it's coming from. My special ingredient here is NY Cheesecake! If you vape this mix as a Shake n Vape it is still very good, but you can tell and taste that the Battle between the Cheesecake and Custard has just begun. After a 4 week steep the Vanilla Custard is the clear victor but the battle leaves behind a extra sweet, thick, and creamy coat of armor that the Vanilla Custard wears with the utmost respect! I am very proud of and love this recipe. The way my friends and family try to fight me over it if I have a bottle laying around, i'd feel confident in saying they love it too... I'd love to hear your feedback, just make sure you make plenty because after the 4 week steep it will not last long! This recipe is the property of CloudyMotherChucker and released under the CC Attribution-NonCommercial-Sharealike 4.0 license. You may not copy, derive or commercialize this recipe without following the terms of this license or the explicit permission of the creator. Mixed up a small test batch, and let it steep for a month. Vaped it all in a day. Now, I'm making a couple of 120's so they will last. 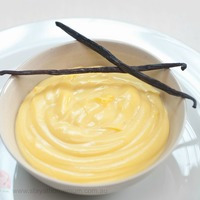 :) Wonderful plain vanilla custard, just what I was looking for.